Civil War Reenactors Canvas Soldiers Army Haversack Bag Sack 6. Reproduction Civil War canvas haversack with strap, leather tie closure, and removable cotton inner lining. 11-3/4" tall by 12" wide. Strap measures approximately 51" long end to end by 1-3/4" wide. 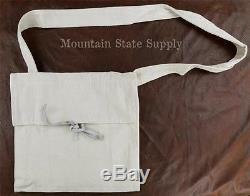 Civil War Reenactors Canvas Soldiers Army Haversack Bag Sack 6" is in sale since Thursday, March 27, 2014. This item is in the category "Collectibles\Militaria\Civil War (1861-65)\Reenactment & Reproductions\Uniforms".